Both the Egyptian government and private companies are looking to increase the production of green energy. But there are still obstacles in making the leap from fossil fuels and natural gas to renewable sources. The cows on Oyoun al-Jannah (Paradise Wells) farm in Fayyoum, Egypt are valuable for many reasons - not least because they are used to generate energy for the houses on the property. Egypt's ministry of environment, in co-operation with the United Nations Development Programme, established several units for the production of biogas from animal waste as part of a pilot project launched in 2012. According to Ahmed Medhat, Executive Director of the Authority for Biomass Energy and Sustainable Rural Development, the energy units are based on a simulation of a natural process that takes place inside the animal's body. A biogas unit consists of an underground chamber where animal waste, diluted in water, is stored in isolation from air. In this environment, micro-organisms can decompose the waste and produce gas. Through pipelines, this gas is channelled to houses where it is used produce energy. The decomposed waste is then used as pesticides. So far, Egypt's government has installed 1300 similar biomass stations in 18 provinces nationwide hoping to contribute to reducing the reliance on gas cylinders. The government is working on the expansion of this project to reduce gas imports, says Medhat. "Egyptians consume one million gas cylinders a day, which means 360 million cylinders a year. The biomass energy generated from animal waste alone can reduce our gas cylinder imports by 20 percent." Medhat says the government is currently drafting guidelines to enact feed-in-tariff schemes as an incentive for the private sector to invest in producing electricity. 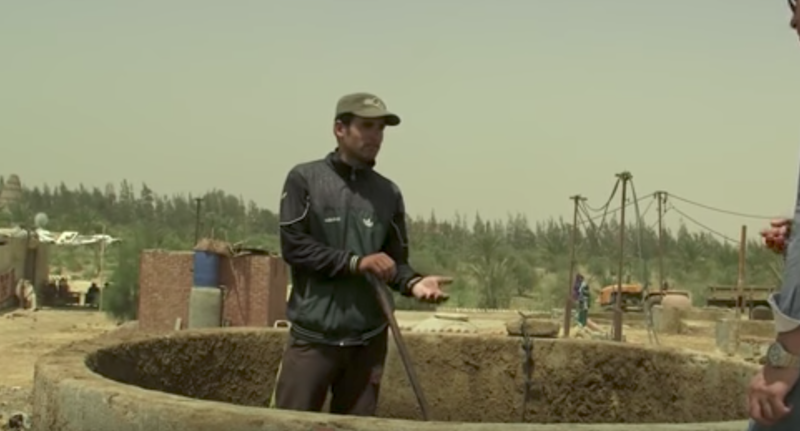 The biogas units in Oyoun al-Jannah farm provide for eleven households and secure pesticides for nearly 23 acres of agricultural land. Nora Goma'a's household is one of the beneficiaries of these biogas units. "We use the biogas to cook and heat water. It spares us the purchase of two gas cylinders a month, which would cost 40 pounds (two US dollars)," she says. According to a report released by the Centre for Environment & Development for The Arab Region & Europe in November 2014, nearly 90 per cent of Egypt's total energy needs come from conventional sources of energy, namely fossil fuels and natural gas. Video and article via AP Archive | YouTube channel. There is great potential to reuse wastewater in the Mediterranean region as currently only around 1% of it is recycled.